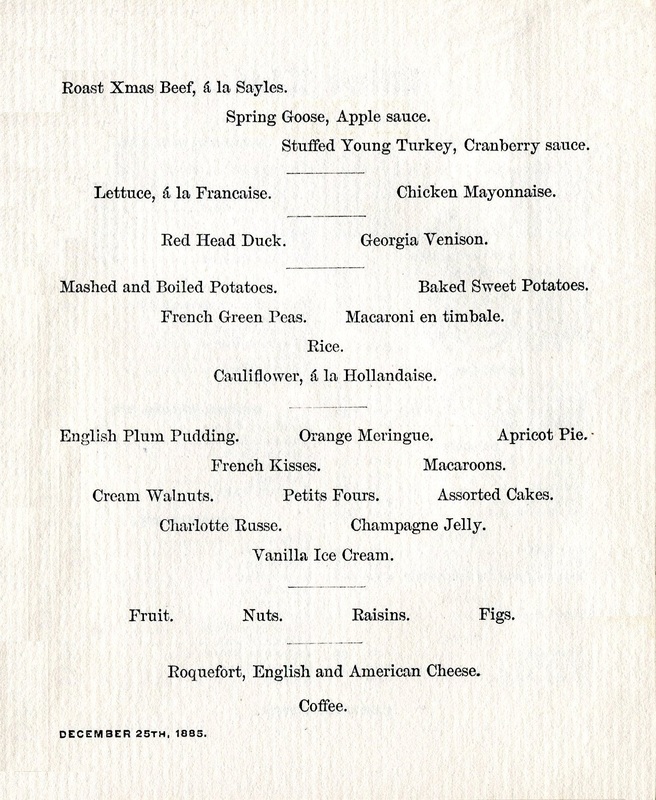 Menus from three winter hotels on Christmas Day in 1885 provide evidence of the foodways and social customs at these newly-established resorts. 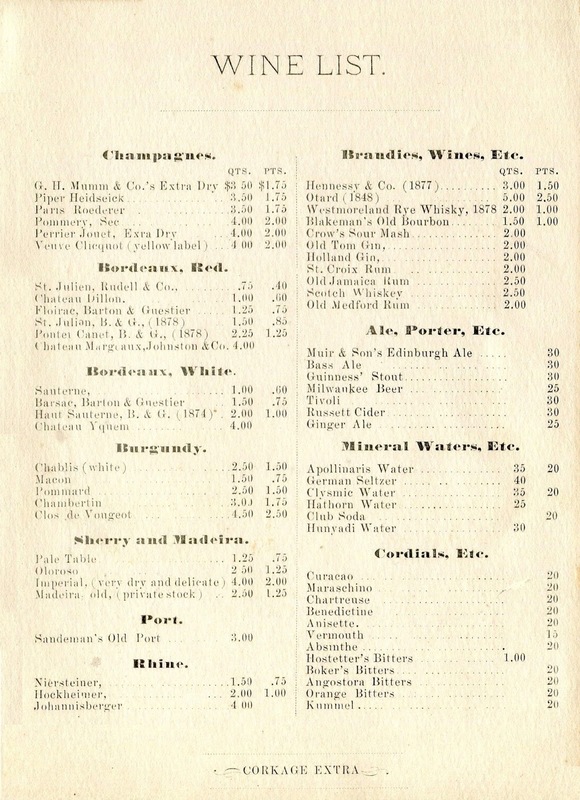 Since regional and seasonal influences were seldom evident in the late nineteenth century, these menus resemble those at other hotels catering to the upper levels of society. 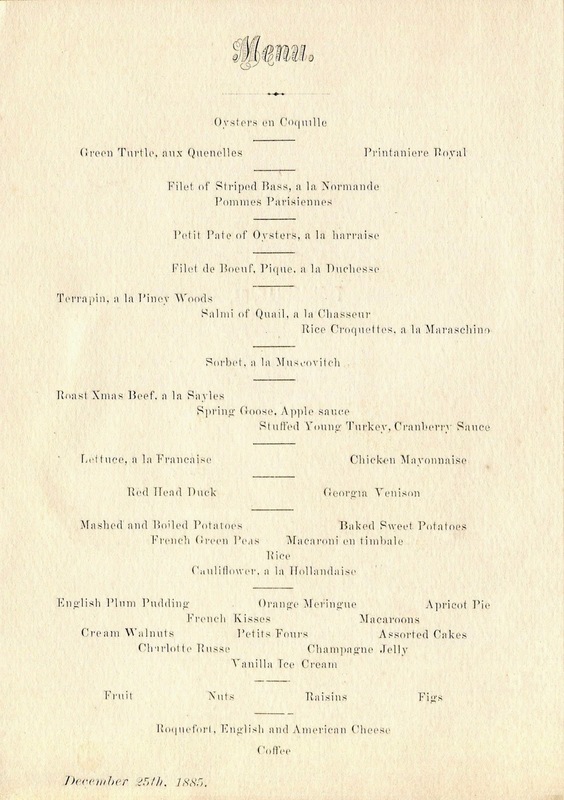 Indeed, the cuisine at any hotel or restaurant was determined mostly by class, not location. 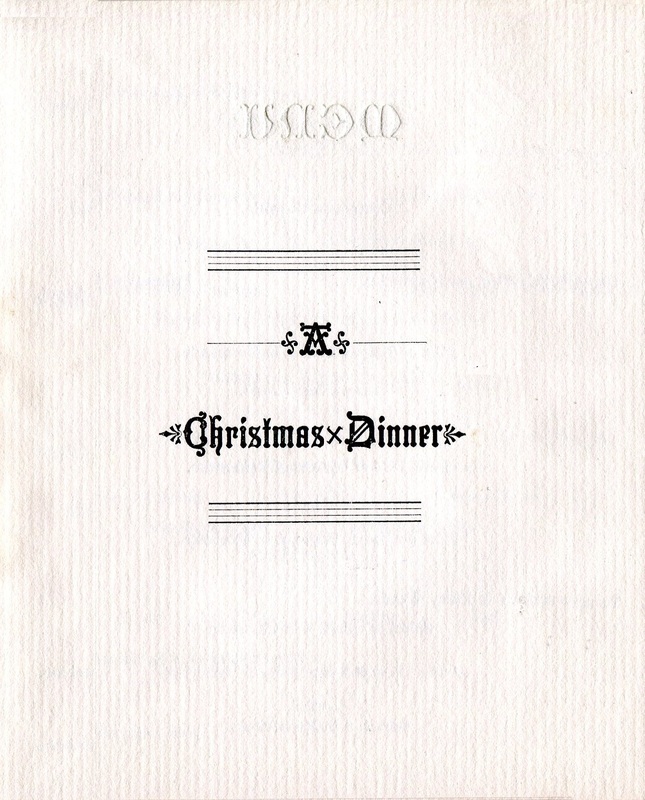 This is illustrated by a menu printed for some of the domestic servants at the most exclusive of these winter resorts. 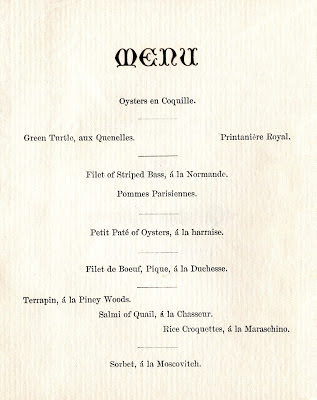 Although the dishes were not as lavish as those served in the main dining room, the menu is more elegant than one might have imagined. 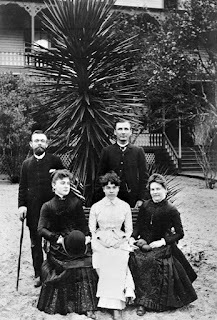 Surrounded by orange trees in DeLand, a new town located fifty miles north of Orlando in central Florida, the Putnam House opened for its first season in 1885. That year a winter freeze destroyed the orange crop, perhaps the earliest commercial disaster of its kind in the budding citrus industry. 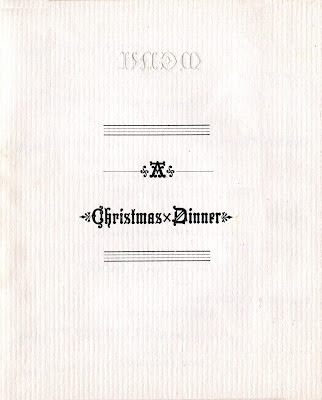 Although the engraver and stationer Louis Dreka of Philadelphia established a branch in Deland in 1885, this Christmas menu was made by the Plimpton Printing Company in Hartford, Connecticut. This year would also be remembered for the horticulturalist Lue Gim Gong moving to Deland. Born in China to a family of farmers, Lue became known as “the citrus wizard,” after developing a frost-tolerant strain of the Valencia orange, a variety that is still grown in Florida. 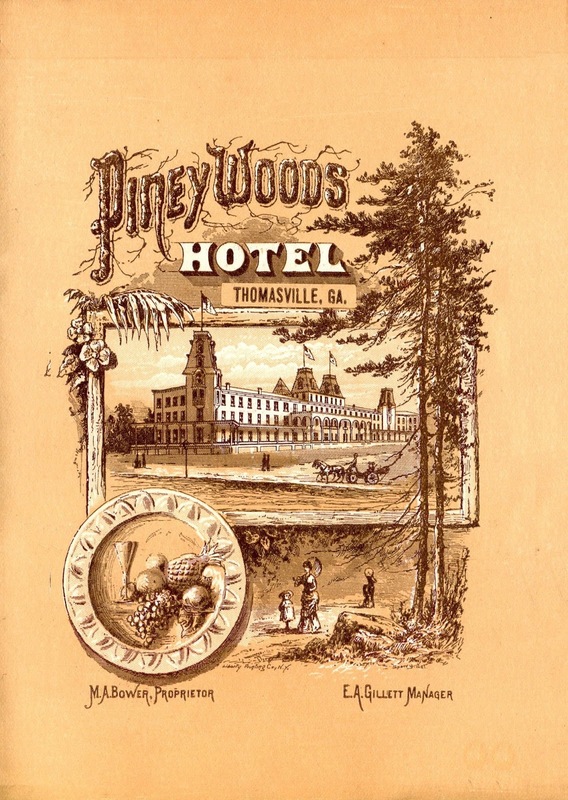 The Piney Woods Hotel in Thomasville opened for its second season on December 1, 1885. 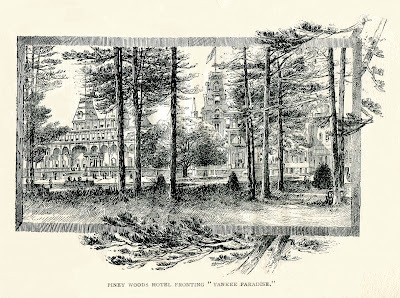 Nestled in the pine forests of south-central Georgia, just above the Florida line, this upper-middle-class resort was noted for its dry and balmy weather. 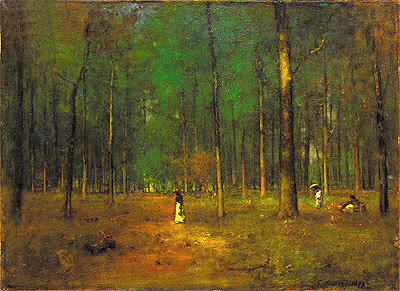 It often attracted people with respiratory problems, just as those with hay fever fled to the White Mountains in the summer. 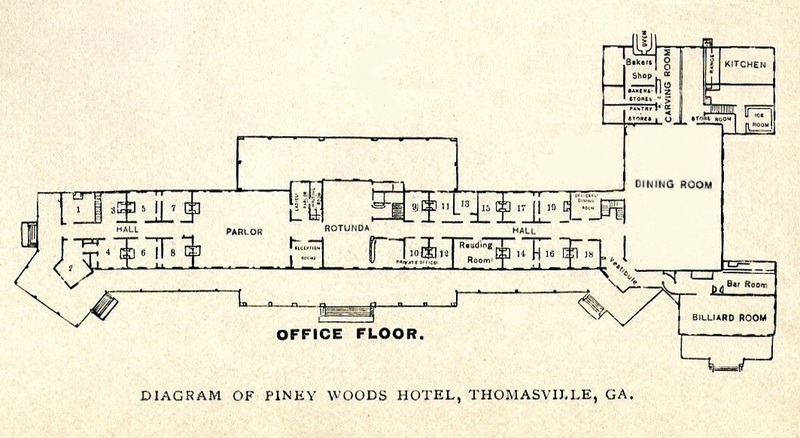 One of the best ways to get to Thomasville from Boston was to travel by steamer to Savannah and then take a train for the last 225 miles. 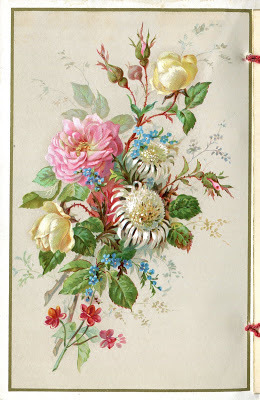 Guests from New York often came via the Pennsylvania Railroad and Atlantic Coast Line. 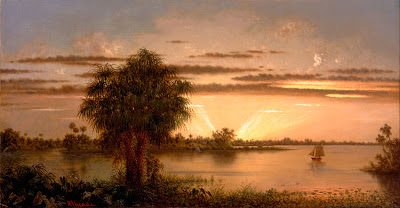 Departing at 9:30 PM in the comfort of a Pullman Sleeper, they connected to the Savannah, Florida and Western Railroad at Waycross, arriving at Thomasville at 1:30 PM on the second day; the trip took about forty hours. Fresh meat and other provisions also arrived here from New York by rail each day, along with the city’s two-day-old newspapers. 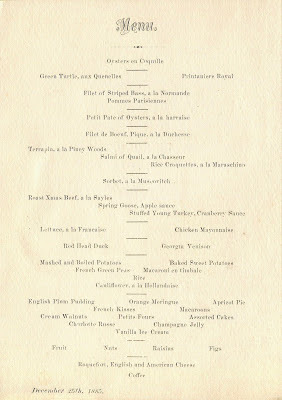 The hotel’s regular daily menu often featured roasts with names like “ribs of N.Y. beef,” “Long Island duck,” “Philadelphia squab,” and “Vermont turkey.” Some foods came in from the other direction, such as the fresh oranges from the Indian River in Florida. The shipment of select foods over long distances was not unusual. 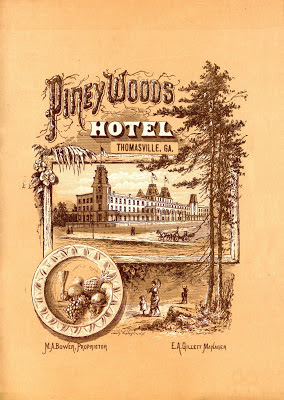 In fact, the Piney Woods advertised that its cuisine was unexceptional, meaning that it served the same fare as other fine hotels. 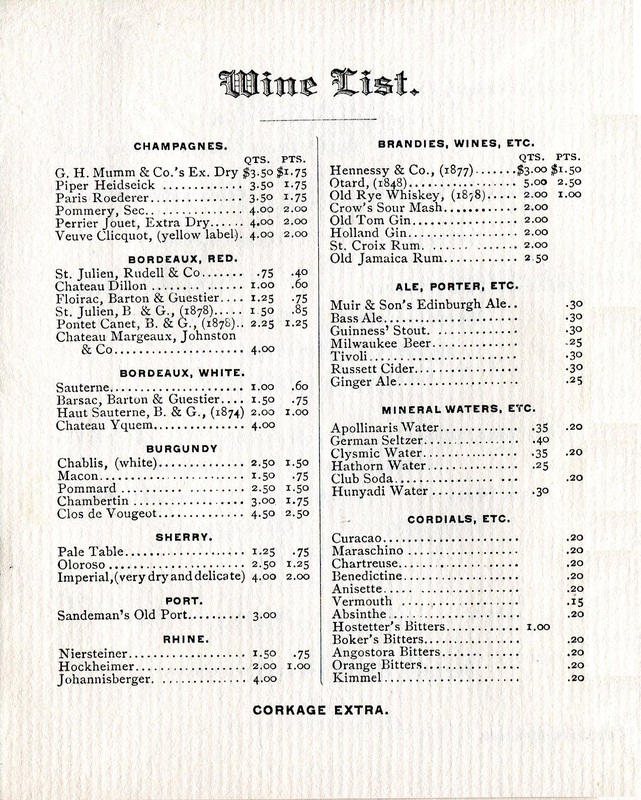 The menu shown below is printed on card stock made by the society stationer Bailey, Banks and Biddle in Philadelphia. The area was renowned for game birds like quail, turkeys, partridges, and rice birds. 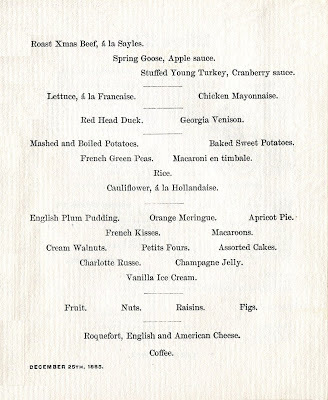 Although the game dishes were occasionally identified as local, such as the “Georgia venison” on this menu, it was the exception. Still, the Piney Woods was proud of the regional specialties, mentioning some of them in its advertising brochures. 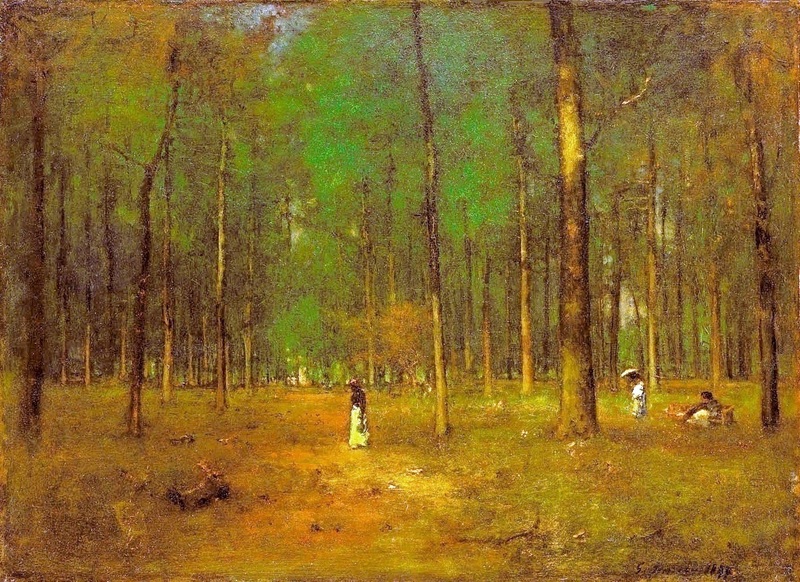 Interestingly, the nearby groves of Le Conte pears, a hybrid introduced to Georgia in 1856, were acclaimed for their natural beauty, rather than as a source of food. 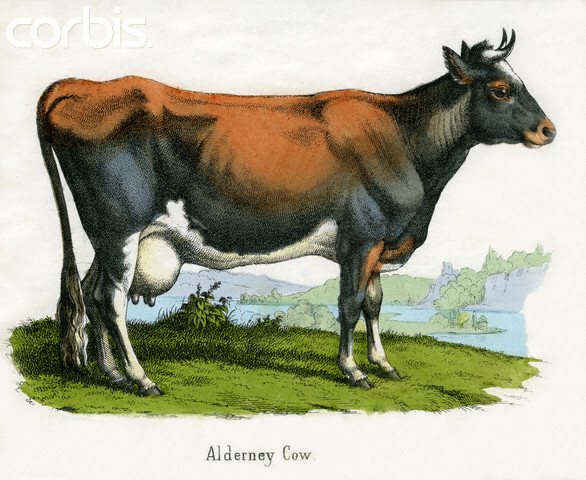 The hotel purchased its milk from a local farm with a herd of Alderney cattle, a breed that is now extinct. 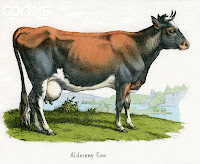 These small, docile cows produced copious quantities of milk that made very rich butter. 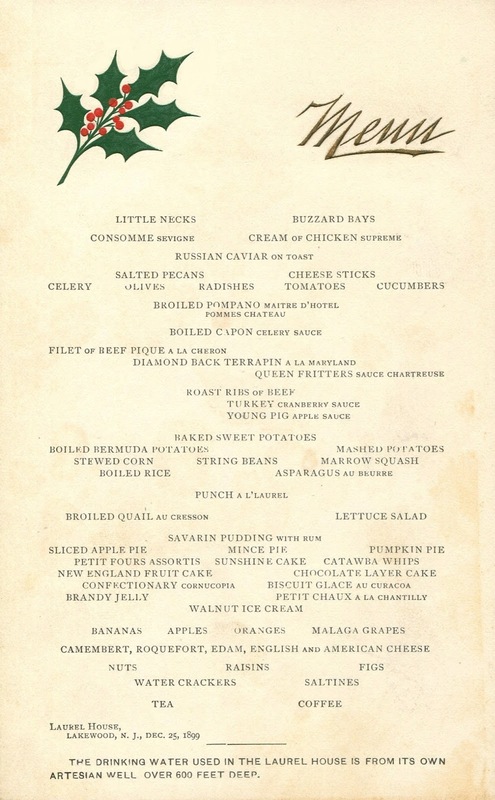 If the hotel had operated by today’s ethos, it may have identified more of the local foods on its menus, highlighting dishes like “Thomasville quail,” “Le Conte pears,” and “Alderney butter” to establish its locavore bona fides. 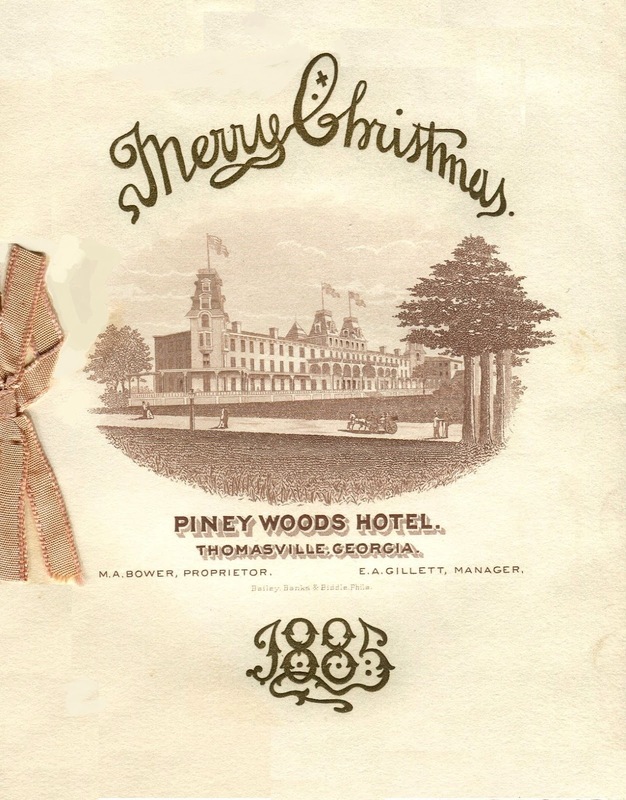 The Piney Woods also printed its Christmas menu in 1885 on stock card normally used for the daily menu. The reason for making the less-expensive version below is not known. 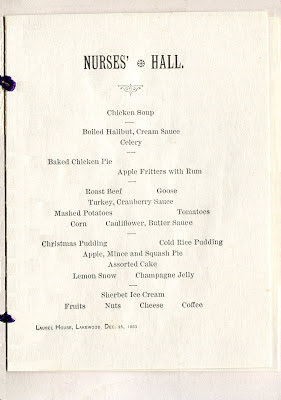 Featuring the same bill of fare, it may have been intended for nurses (now called nannies) who cared for small children. 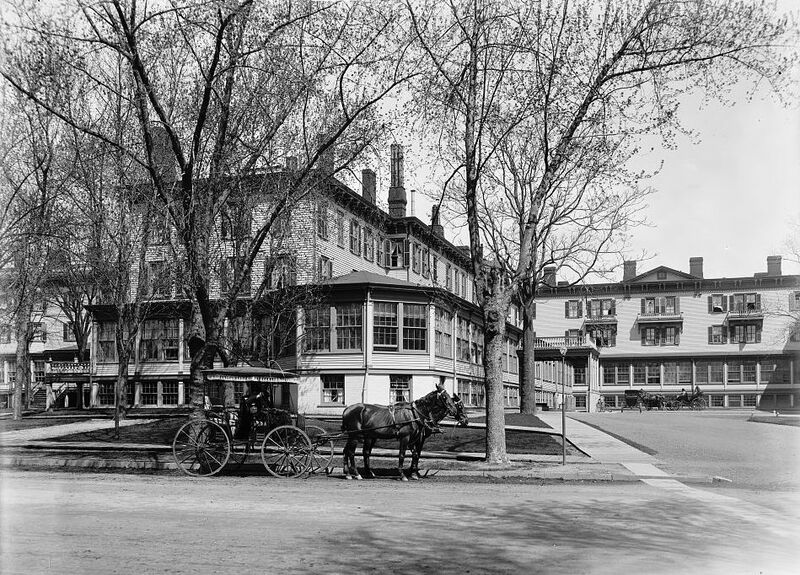 Since guests were charged full board of $20 to $25 per week for their servants who had single rooms, or $10 per week for those who shared a room, the nurses staying at this hotel may have been served the same dishes as the other guests. Much of the interior space in nineteenth-century hotels was used for the public rooms. Accordingly, the bedrooms were very small by today’s standards. 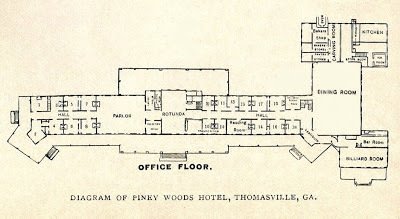 This plan of the ground floor, or “office floor” as it was called, shows that the Piney Woods had a large dining room, situated between the kitchen and the bar and billiard room. Having only one dining room did not present a social problem. 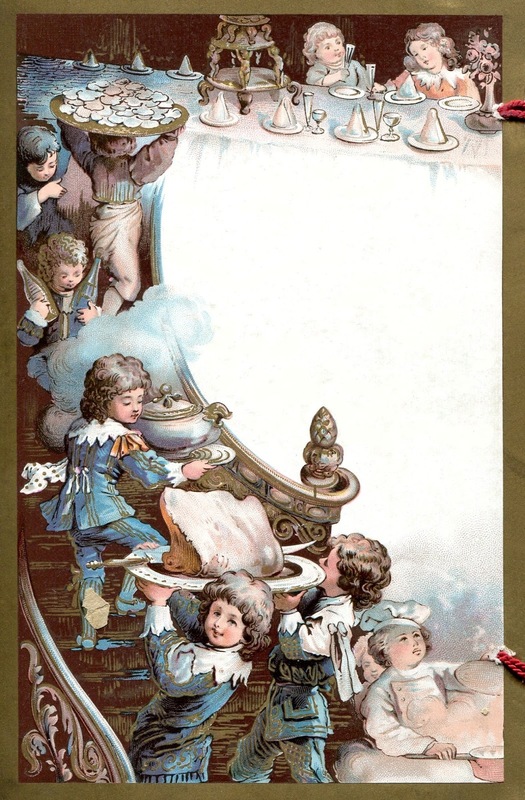 On Sundays and special holidays, dinner for the servants and children typically began at noon, while the regular guests were served afterwards, usually between the hours of 2:00 PM and 4:00 PM. 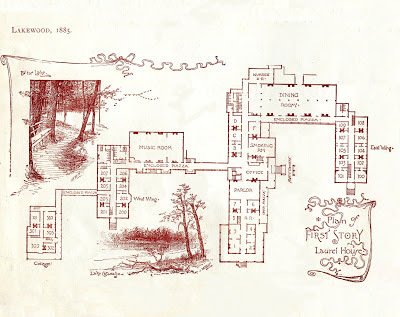 The upper-class Laurel House was located in Lakewood, only sixty miles south of New York City. Open from October until June each year, this luxury resort in the pine barrens of New Jersey enjoyed a somewhat milder climate, allowing it to offer outdoor recreational activities during the winter and spring. In that respect, the hotel promoted itself more as a convenient resort than as a sanitarium. The guest list often resembled the social register, featuring names like Gould, Vanderbilt, Rockefeller, Astor, and Rhinelander. In addition to these rich families, the hotel attracted other types of distinguished guests, such as the writers Rudyard Kipling and Mark Twain, the architect Stanford White, and the jurist Oliver Wendell Holmes. 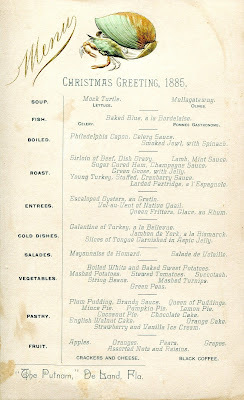 The refined cuisine on the richly-lithographed Christmas menu shown below reflects hotel’s wealthy clientele. Although the Laurel House only accommodated 300 guests (the same number as the Piney Woods Hotel), it had a separate dining room for the nurses, as shown on this diagram of the first floor. 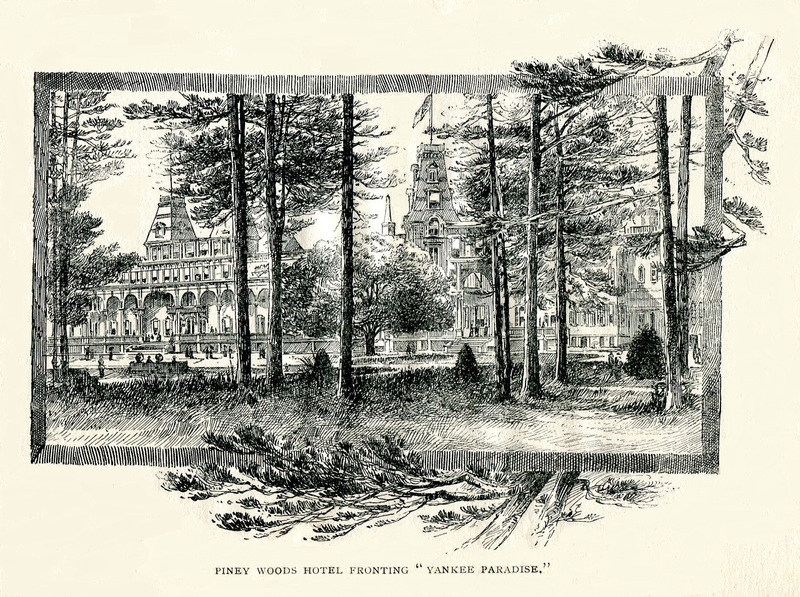 The large main dining room, distinguished by eight open wood-fireplaces, was also used as a ballroom. 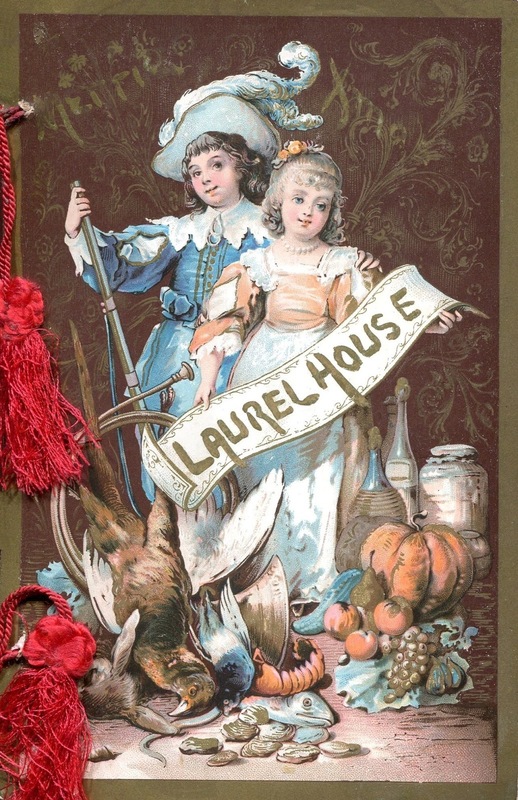 In 1885, the Laurel House had a different Christmas menu printed for the nurse’s dining room. 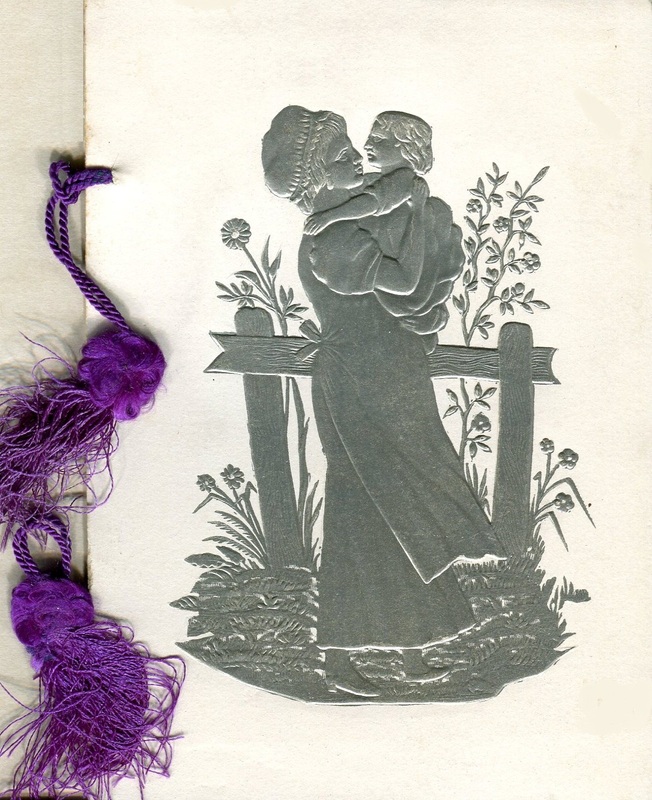 Featuring an embossed and silver-gilded image of a young nurse holding a child, the charming menu shown below is an example of Victoriana, reflecting a design style that is evocative of the era. 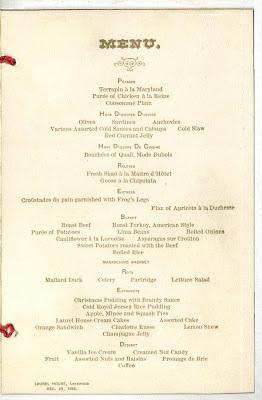 Although this bill of fare features traditional roasts like turkey, goose, and beef, it does not include the more refined and expensive dishes served in the main dining room. The names of these dishes are revealing. 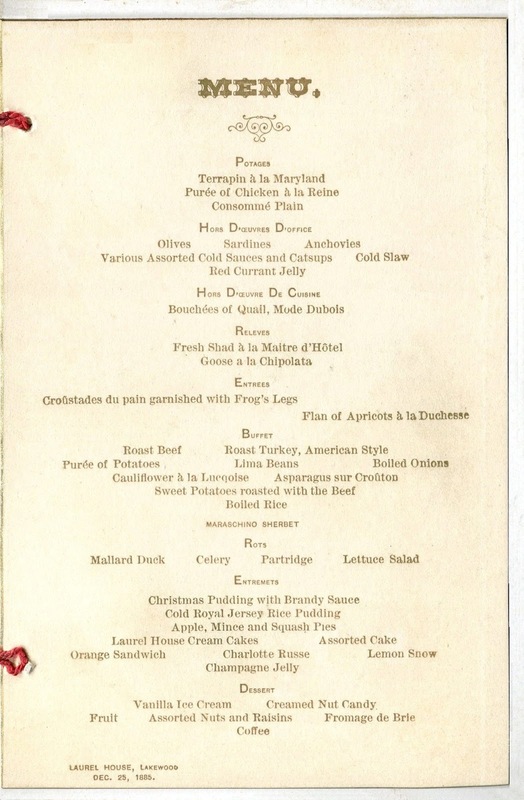 For example, the dish called “turkey, American style” in the main dining room was changed to “turkey with cranberry sauce” on the nurse’s menu; the “cold royal Jersey rice pudding” was simplified to “cold rice pudding,” perhaps reflecting an adjustment to the recipe. 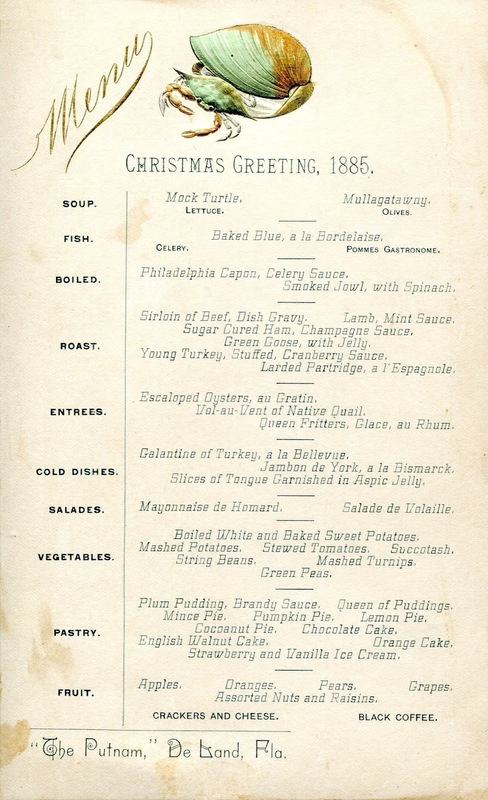 Although the nurses were served their Christmas pudding without the brandy sauce, this holiday dinner must have been regarded as a very special occasion in the upstairs-downstairs world of the Gilded Age. 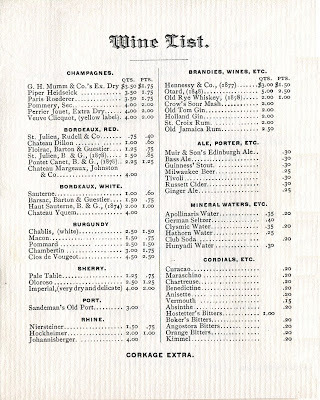 Such menus are particularly scarce, suggesting that they were seldom printed or saved as mementos. After all, the nurses were not on vacation; they were not even allowed in the downstairs parlors. 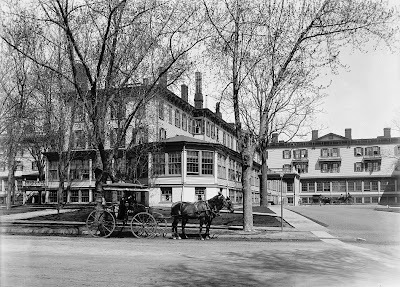 Since small children were also kept in the background at American resorts, you wonder how the nurses kept them quietly occupied on rainy days, while their parents wrote letters, read books, and lounged on the glass-covered piazza, chatting with the other guests. Enlarged throughout the 1880s, the Laurel House had competition beginning in 1891, when the Lakewood Hotel and the Laurel-in-the-Pines Hotel opened nearby. 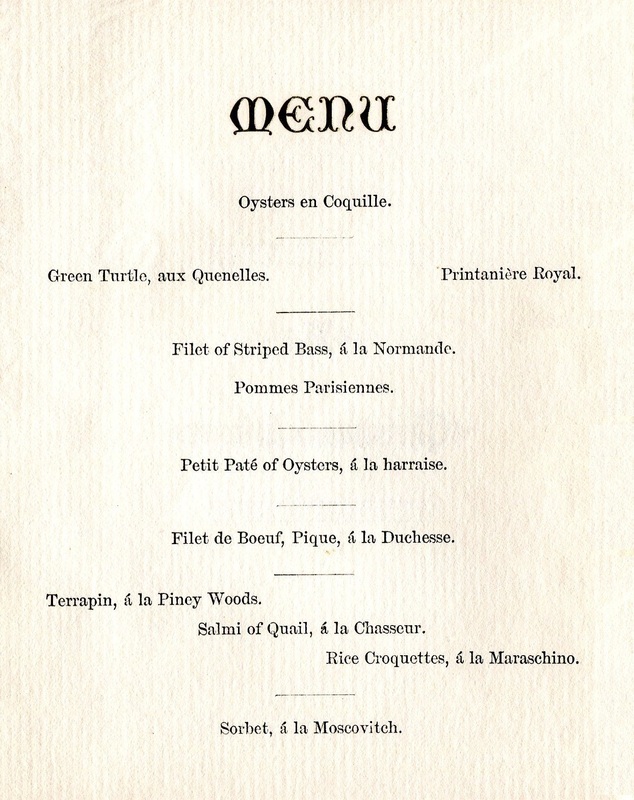 Although the Christmas dinner at the Laurel House in 1899 featured expensive foods like Russian caviar and diamondback terrapin, the bill of fare shown below appears ordinary when compared to the luxurious menu of 1885. 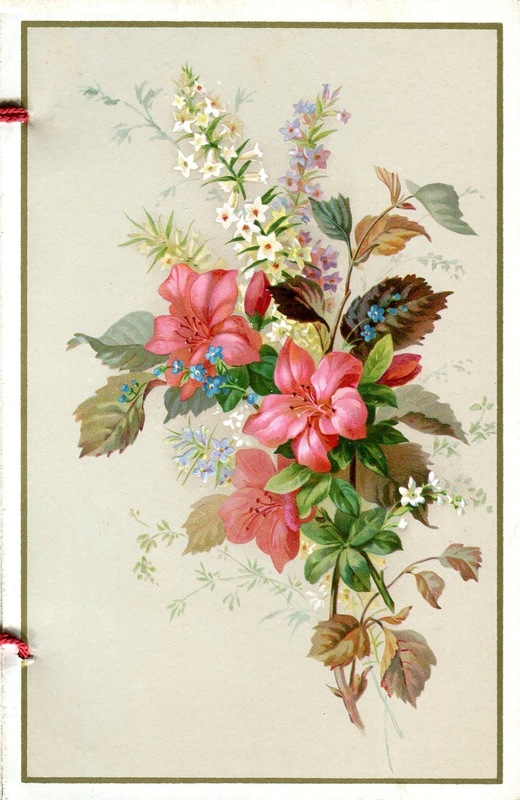 The holiday illustration on this fin de siècle menu comprises a single sprig of holly. 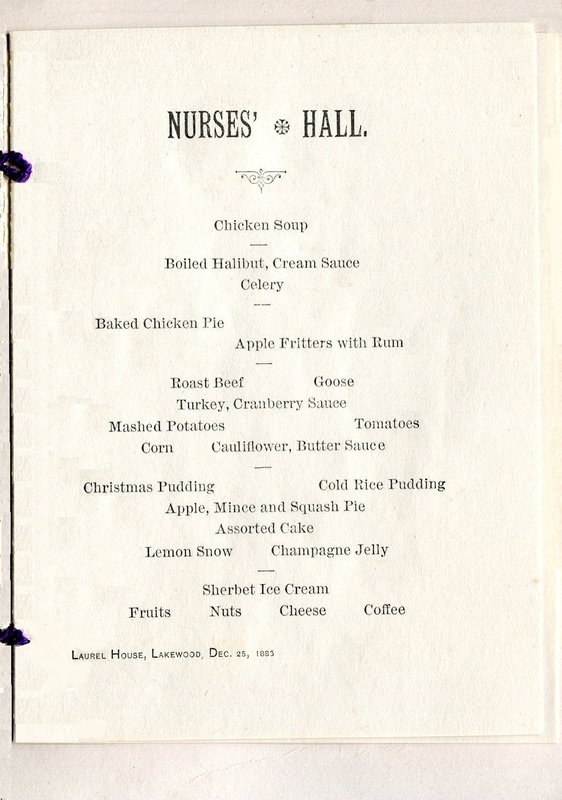 Although there are no other nurse’s menus from the Laurel House in my collection, there is one from the nurse’s dining room at The Homestead, a luxury resort in Hot Springs, Virginia. 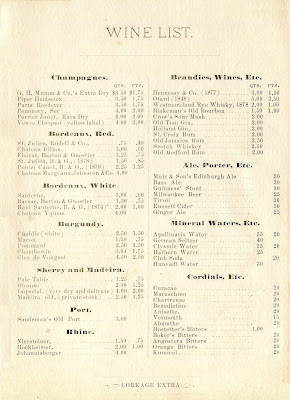 Dated December 12, 1899, the menu shown below comes from a completely different time, place, and occasion, making it difficult to compare with the one from the Laurel House fourteen years earlier. Nevertheless, it is an interesting historical document in its own right. 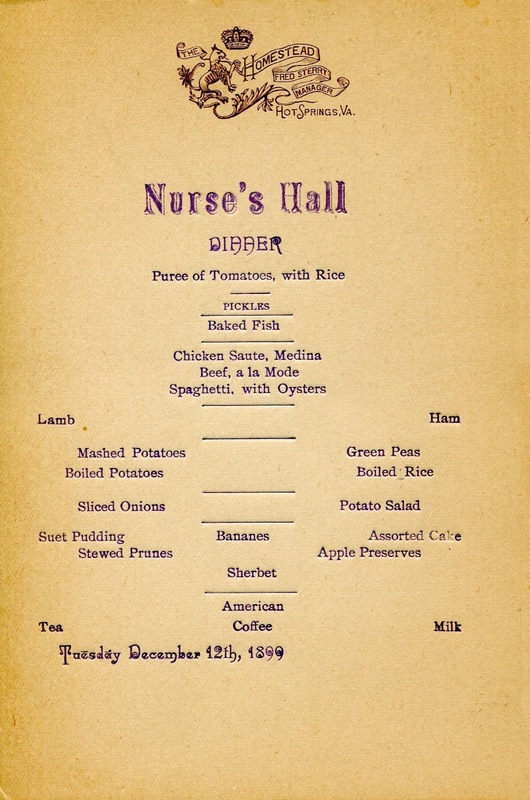 Considering that the Homestead opened with the backing of financier J. P. Morgan, it is safe to assume that the selection of dishes on the nurse’s table d’hote menu was meager compared to what was served in the main dining room that day. 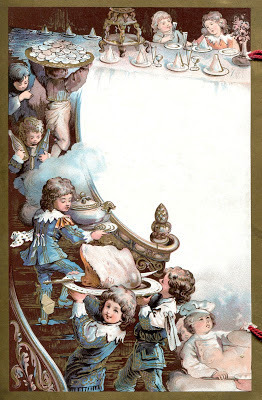 In addition, the names of the dishes on this carelessly-printed card seem to reflect the standard kitchen practices of the day, insuring that no food was wasted. For example, undefined dishes like “baked fish” and “beef a la mode” are described broadly enough to include whatever foods were leftover. Spaghetti, a low-cost dish that was routinely served to guests of all classes, is here combined with oysters. This is an unusual combination which may have been inspired by the availability of a few bivalves that were on the verge of spoiling. There is no way of knowing, nor would any of this necessarily been seen as a problem. 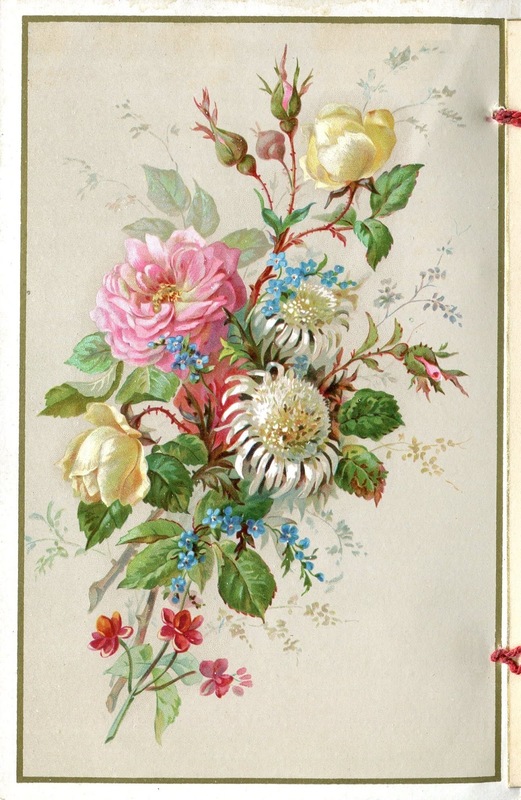 In 1890, the average weekly wage for those in domestic service was $3.25, plus room and board, which was more than factory workers were making at the time. I've missed your posts. As always a joy. I can't wait to hear your lecture. 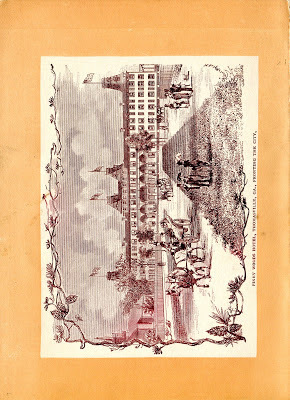 The 1st exhibit at the museum was amazing... the condition of the menus were so perfect that they looked new. 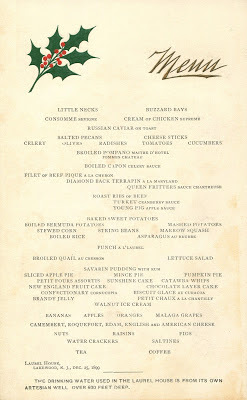 I love the changes in style through the decades... the menus tell so much about the times. Lots of good information. 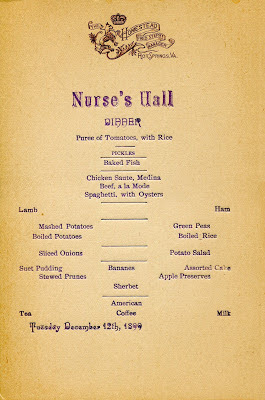 Do you assume nurses were necessarily higher status servants? I guess that wouldn't be surprising. Comparing wages and prices can be difficult because they had different rates of inflation. Food constituted a much, much higher proportion of the average person's budget in those days.I think that made being a servant somewhat more popular then we would imagine. An unskilled factory worker in Manhattan might make two or three what the 57th Street servant did. But she lived in a crowed tenement and ate less well.